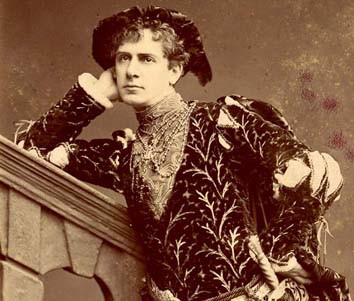 Terriss, William (1847-1897): One of England’s leading actors of the later Victorian stage. His birth name was William Charles James Lewin. He rose quickly through the ranks and, in 1880, he joined Sir Henry Irving at the Lyceum Theatre. Three years later, he moved to the Adelphi Theatre where, as the hero of romantic melodramas, often playing opposite Jessie Millward, he became known as "Breezy Bill." In 1897, he was stabbed to death by Richard Prince at the royal entrance.